Don’t get your hopes up. This is not a prompt to write about Ryan Gosling. But if you feel you absolutely must – knock yourself out. I am not in the business of holding people back! I am in the business of encouraging growth. Growth begins with a seed. A seed needs a container. The container needs to be carefully selected so it feels just right. When I was a girl and onwards into adulthood, I always had a drawer full of notebooks. With the best intentions, I would write conscientiously in any one of those said notebooks for a week. Or two. Sometimes more. And then I would drift on to a newer notebook. A cooler notebook. A prettier one. I was extremely fickle when it came to stationary. I just couldn’t commit, and that was long before the days of endlessly upgrading an i-phone. Can you remember a notebook you had as a child? A diary? 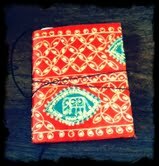 A journal? What did it look like? Describe the cover. Where did it come from? Was it a gift or did you choose it? What did you write in it?